Turn oven on 190 degrees celsius. 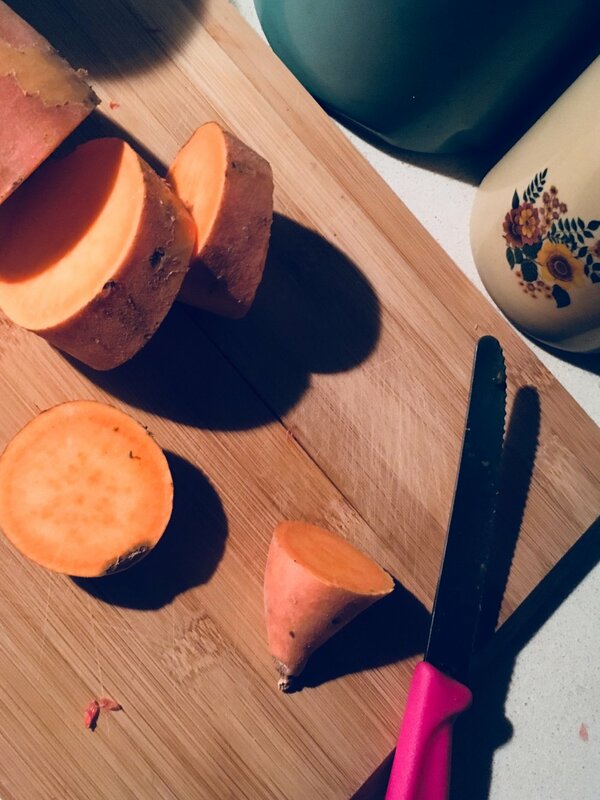 Leaving the skin on the rinsed sweet potato adds fibre and leaves extra nutrients that lie just underneath the skin of the vegetable. Gut bacteria LOVES fibre present in tubers. Extra virgin olive oil instead of processed vegetable oils like canola oil is much better for you. Get your hands dirty and rub the sweet potato well with salt and oil. have your oven nice and hot at 190 degrees, since the caramelisation of the sweet potato adds the flavour. The extra high heat, fan forced oven will ensure you get rid of the steam forming in the oven to ensure the nice caramelised flavour instead when the sweet potato browns. Give it 50 - 60 min and check till you are satisfied with colour and flavour.